I'm getting my curls, camera ready for the festive period! When I first tried to restore my curls back in 2011, I came across the website British Curlies , the website who was created by Keisha Jo Lawler who gave it's name because " I feel that we deserve a website where we can connect and share as having curly hair in the UK is a unique experience that anyone living here can attest to. Also we are based here in the UK." So along with a great forum that helped me there was also a shop "www.britishcurlies.co.uk/store" that was later relaunched as Curly Emporium. Most the time I make sure I see if they have discount codes or offers albeit it's rare so I made sure before I grabbed two curl enhancing smoothie when it was half price. My two original tubs of the smoothie and deep treatment masque are at the end and will last about a month maybe which is good as I've had it since about June/July. Being able to support a business that is dedicated to sharing, helping and providing us curlies/naturals with products & information that could help us manage and learn about our hair is important. It's independently run and they really do try and get the products that we desire to try. Barclay's are also trying to support the way we shop by introducing their new Freedom Rewards card. Earn points as you shop. Something I strive to do all the time. Curly Emporium is my go to online store 98% of the time, the prices can work out cheaper than other websites and I've never had a problem - yet, just how I'd like it to stay. Do you shop at the Curly Emporium? What's your HG product? Most items were paid for using a gift voucher. I love everything you've photogrpahed! 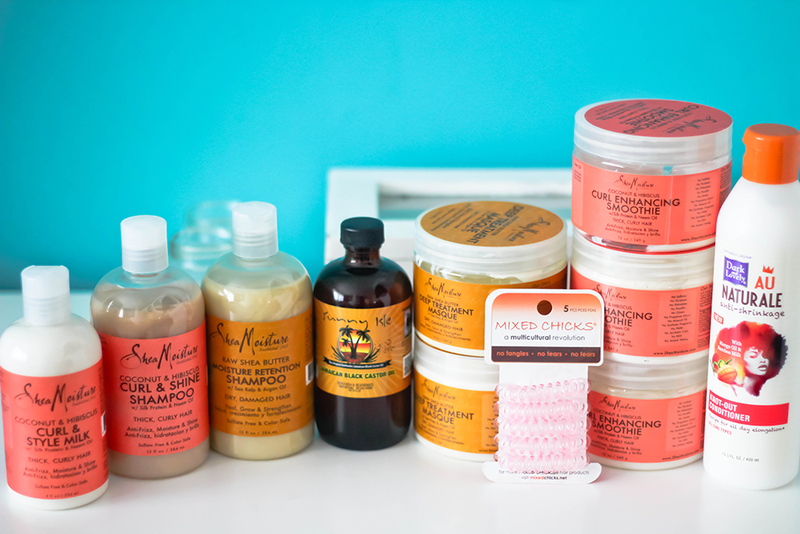 As you know, I'm a big fan of Shea moisture and I really love the castor oil by Sweet Isle! How do you find mixed chicks? Honestly? I'm not that much of a fan of the products I tried previously last year but that being said these hair bands? OH EM GEE! BOMB.COM She loves them - gotta collect them all LOL! I'd still be open to try the brand again though. Just finding what works well. Ohhh I know your love for Shea! My hair is naturally wavy, used to have pretty tight curls when I wa younger but now it's just bleeeeh. Totes just bookmarked the website!